We propose a novel approach for the temporal interpolation of city maps. The input to our algorithm is a sparse set of historical city maps plus optional additional knowledge about construction or destruction events. The output is a fast forward animation of the city map development where roads and buildings are constructed and destroyed over time in order to match the sparse historical facts and to look plausible where no precise facts are available. A smooth transition between any real-world data could be interesting for educational purposes, because our system conveys an intuition of the city development. The insertion of data, like when and where a certain building or road existed, is efficiently performed by an intuitive graphical user interface. Our system collects all this information into a global dependency graph of events. By propagating time intervals through the dependency graph we can automatically derive the earliest and latest possible date for each event which are guaranteeing temporal as well as geographical consistency (e.g. buildings can only appear along roads that have been constructed before). 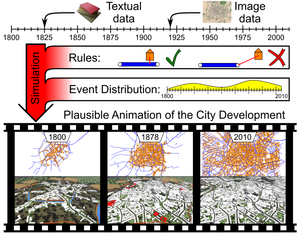 During the simulation of the city development, events are scheduled according to a score function that rates the plausibility of the development (e.g. cities grow along major roads). Finally, the events are properly distributed over time to control the dynamics of the city development. Based on the city map animation we create a procedural city model in order to render a 3D animation of the city development over decades.